Welcome to our BioWash website. 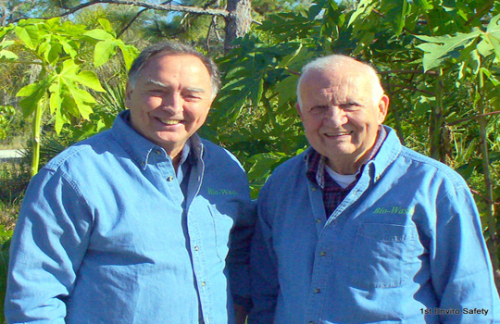 This site is dedicated to promoting improved crop production and yield through the use of BioWash Plant Booster, an amazing bio-stimulant solution formulated by Dr. Ted Tidwell, owner of 1st EnviroSafety Inc, a small family owned colloidal soap company located near St James City Florida. Dr. Tidwell is the original owner of 1st EnviroSafety and the formulator of all the Company’s proprietary solutions. He brings to the company a long and rich history of successful entrepreneurship and industry. A life-long learner, Dr. Tidwell’s work with colloidal soap solutions is just one more accomplishment in a long line of successful endeavors. His work with BioWash is no longer just a business interest; it’s a passion. His desire is to get BioWash into the hands of every farmer on the planet and he works tirelessly every day toward that goal. Dr. Leon Hesser has been in active partnership with Dr. Tidwell for many years and has developed his own thriving BioWash distributorships in several international locations. He earned his PhD in Agricultural Economics from Purdue University and held a variety of high ranking national and international government positions in the State Department before retiring from government service. After retirement, Dr. Hesser served as a professional consultant to over 20 international countries, helping them find ways to improve their agricultural programs. The work being done by Dr. Hesser mirrors that which he participated in with his long-time mentor and friend, Norman Borlaug (for whom Dr. Hesser wrote a biography entitled “The Man Who Fed the World”). Dr. Borlaug won the Nobel Peace Prize for his efforts in curbing world hunger by introducing high yielding varieties of wheat into countries where high populations and low agricultural production were contributing to starvation among the people. Borlaug’s work in Southeast Asia was coined “The First Green Revolution”. Dr. Hesser shares Dr. Tidwell’s passion and enthusiasm for BioWash, seeing it as a continuation of the work started by Borlaug. Dr. Hesser believes BioWash may prove to be the catalyst for “The Second Green Revolution” and hopes it will reach around the world. A review of the various grower successes throughout this site is expected to pique your interest in trying BioWash on your own gardens and crops. Once you’ve tried BioWash, we fully expect you to become as excited about this marvelous plant stimulant as we are. Excitement can lead to passion…. and passion to action. Who knows? You may even want to start a “Third Green Revolution” in your own backyard!